John Partridge (1789-1872), Portrait painter. Artist associated with 41 portraits, Sitter in 3 portraits. Sir Charles Barry (1795-1860), Architect. Sitter in 8 portraits. Charles John Canning, Earl Canning (1812-1862), Governor-General and first viceroy of India. Sitter in 12 portraits. Nicholas William Ridley-Colborne, 1st Baron Colborne (1779-1854), Statesman and financier. Sitter in 5 portraits. Sir Charles Lock Eastlake (1793-1865), Painter; President of the Royal Academy and Director of the National Gallery. Sitter in 15 portraits, Artist associated with 2 portraits. Henry Hallam (1777-1859), Historian. Sitter in 13 portraits. Sir Benjamin Hawes (1797-1862), Advocate for the arts and politician; MP for Lambeth and Kinsale. Sitter in 2 portraits. Henry Gally Knight (1786-1846), Writer on architecture. Sitter in 7 portraits. Samuel Rogers (1763-1855), Poet, banker and art connoisseur. Sitter in 23 portraits. George Vivian (1798-1873), Artist. Sitter in 3 portraits. Sir Thomas Wyse (1791-1862), Irish politician and diplomat. Sitter associated with 8 portraits. The Conservative Prime Minister Sir Robert Peel divides his own party by repealing the unpopular Corn Laws, which prohibited the import of cheap grain from overseas, viewed by many as causing the famines in Ireland (which peaked in this year), as well as domestic hardships following a bad harvest. Peel, defeated on a separate issue, resigns. 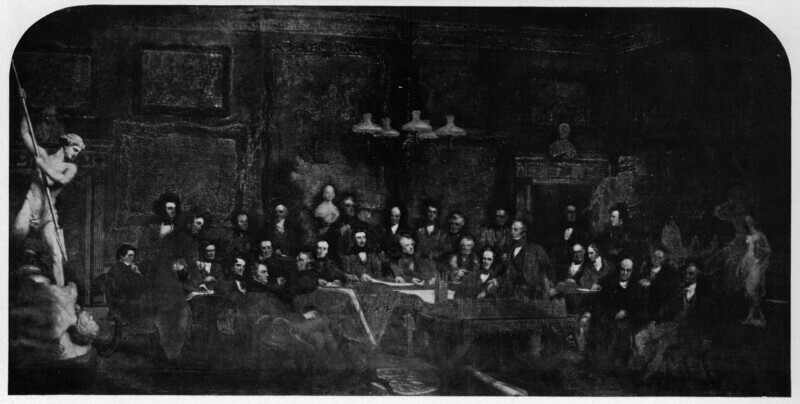 The Whig Earl Russell becomes Prime Minister. Ether is used for the first time as anaesthetic in an operation by the dentist William Morton, while surgeon John Collins Warren removes a tumor on a patient's neck. Edward Lear, the popular humourist and artist, and author of illustrated nonsense verse (including 'The Owl and the Pussycat'), publishes his Book of Nonsense. The first Anglo-Sikh war ends with the Treaty of Lahore, by which Jammu and Kashmir are ceded to the British. The war had been fought between the Sikh kingdom of the Punjab and the British East India Company, with conflict escalating after internal disorder in the Punjab led the East India Company to increase their military presence on the border.